Answering the call to adventure shouldn't be the most difficult part of your cycling journey. Which is why we have designed our Lenox Hitch Mounted Tray Rack to provide the convenience you need when looking to take on your next two-wheeled conquest. The Lenox's wheel-mount design provides ease when loading and unloading by sitting lower, allowing for less lift when mounting your bikes, while sacrificing nothing in the way of road clearance. Unlike roof-mounted racks that require the removal of the bike's front wheel, the Lenox Tray Rack requires no disassembly whatsoever. Simply lift your bikes onto the wheel hoops, tie-down using the rubber straps and padded grip arms, and voila! Your bikes are safe, secure and protected from frame damage! The Lenox's grip arms were also designed to accommodate a vast amount of frame types, while the sliding wheel platforms offer a custom fit for bikes with 20-29-inch wheels. This helps to keep your bikes safely in place as you make your way to your cycling destination. Whether carrying a full load or not, the Lenox conveniently offers hassle-free access your car's trunk. 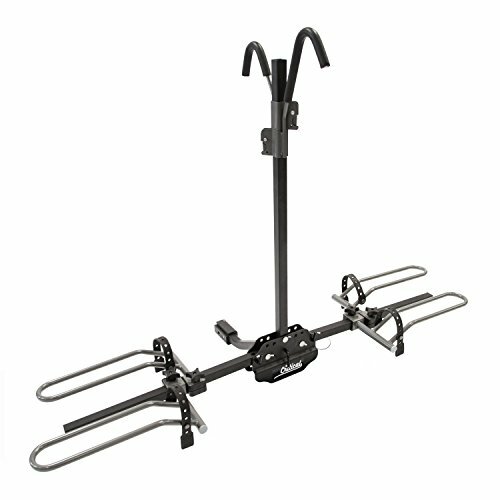 When not in use this rack folds up for a simple storage solution, while the center arm can fold downward to allow access to the rear of your vehicle without having to remove the rack from the hitch mount. Built with strength and durability, the Lenox Hitch Mounted Tray Rack is equipped to provide you with the dependability you need when answering adventure's call! If you have any questions about this product by Critical Cycles, contact us by completing and submitting the form below. If you are looking for a specif part number, please include it with your message.